CHANTILLY, VA (Oct. 8, 2018) —UPIC Health, LLC’s corporate culture is featured as an exemplary case study in the new book Yellow Goldfish: Nine Ways to Increase Happiness in Business to Drive Growth, Productivity, and Prosperity. There should only be one driving metric in business and thatʼs Happiness, according to the authors Stan Phelps and Rosaria Cirillo. 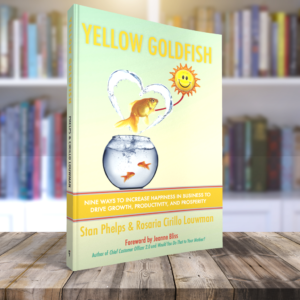 A Yellow Goldfish appears anytime a business does a little extra to contribute to the happiness of its customers, employees, or society. Section II showcases the What. We’ll uncover nine keys for H.A.P.P.I.N.E.S.S. : Health, Autonomy, Purpose, Play, Integrity, Nature, Empathy, Simplicity, and Smile. Section III explains How. Here we share the process behind creating your Yellow Goldfish to Drive G.R.O.W.T.H. : Grounding, Reaching-up, Operationalizing, Wowing (or Wow Blossoming), Taking Time, and Harvesting. The book and the entire Goldfish series is available on Amazon.